Sabha, or Sebha /ˈsɛb.hɑː/ (Arabic: سبها‎ Sabhā), is an oasis city in southwestern Libya, approximately 640 kilometres (400 mi) south of Tripoli. It was historically the capital of the Fezzan region and the Military Territory of Fezzan-Ghadames and is now capital of the Sabha District. Sabha Air Base, south of the city, is a Libyan Air Force installation that is home to multiple MiG-25 aircraft. Sabha was where the erstwhile ruler of Libya, Muammar Gaddafi, grew up and received secondary education and where he also later became involved in political activism. After the Libyan Civil War and the resultant instability in the country, Sabha grew in importance as a slave auctioning town. The city was later seized by forces loyal to the Libyan National Army (LNA) and its leader Khalifa Haftar in January 2019. 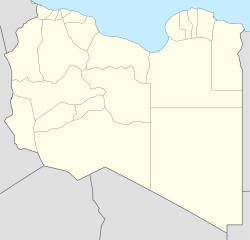 In historical times, Sabha was a major centre of the Libyan caravan trade. Sabha Oasis, near Sabha, was the test site of OTRAG rockets, after launching was no longer possible in Shaba North in Zaire (now Democratic Republic of Congo). On 1 March 1981, an OTRAG rocket with a maximum height of 50 km (31 mi) was launched. It was also a remote test site for the Soviet Space program from 1984 to 1991. In a 2004 report by the International Atomic Energy Agency, the Sabha base was linked with Libya's nuclear weapons program. In September 2011, Anti-Gaddafi forces seized Sabha as part of the Fezzan campaign. No sign of a nuclear weapons program was found. In April 2017, BBC reported that there was a slave market for African migrants in Sabha. In January 2019, control of the city was transferred to forces loyal to Libyan National Army (LNA) leader Khalifa Haftar. Sabha has a hot desert climate (Köppen climate classification BWh). Sabha is famous for the Fort Elena castle, which is the castle featured on the reverse of the ten dinars banknote of Libya. Fort Elena was previously known as Fortezza Margherita, built during the Italian colonial period. Currently the Italian-built fort is a military institution. Sabha University is situated in the city. It has been involved with field studies in the desert. There are numerous irrigation canals, which are used to provide freshwater for growing crops. The city is served by Sabha Airport, which underwent expansion in the late 1970s. An 800 km (500 mi) long railway has been proposed from Sabha to the port of Misrata for iron ore transport. This railway could continue to Niger and beyond. In 2017, The United Nations Migration Agency reported that Sabha had turned into a modern-day slave auctioning town. Each slave (mostly migrants from countries to the south of Libya, especially Nigeria) was sold for around US$325, with up to 1000 such sales each month. While this aspect of Sabha had been kept under check during the reign of Muammar Gaddaffi, it raised its head again due to the turbulence in Libya caused by the civil war. Most of the migrants came here escaping equally tragic conditions back home in Burkina Faso, Nigeria and other neighbouring African countries. In January 2019, forces loyal to LNA leader Khalifa Haftar launched an operation to take control of Sabha and were able to enter the city by the end of the month. On January 29, 2019, it was announced that Haftar successfully captured Sabha. In February 2019, Haftar's were spotted patrolling the city's neighborhoods. ^ Malcolm, Peter; Losleben, Elizabeth (2004). Libya. Marshall Cavendish. p. 10. ISBN 978-0-7614-1702-6. ^ Walt, Vivienne. "The Capture of Gaddafi's Son: The Reformer Who Refused to Reform Archived 2011-11-22 at the Wayback Machine." TIME. 19 November 2011. Retrieved 19 November 2011. ^ Francesca Davis DiPiazza (2006). Libya in Pictures. Twenty-First Century Books. ISBN 0-8225-2549-6. ^ a b Harrison, Emma (10 April 2017). "Migrants from west Africa being 'sold in Libyan slave markets'". The Guardian. Archived from the original on 22 June 2017. Retrieved 21 June 2017. ^ a b DiPiazza, Francesca (1 September 2005). Libya in Pictures. Twenty-First Century Books. p. 19. ISBN 978-0-8225-2549-3. Archived from the original on 11 December 2013. Retrieved 26 November 2016. ^ "Пранаб Мукерджи: Коррупция – это зло, которое может угнетать дух нации". Vedomosti. Archived from the original on 13 March 2016. Retrieved 12 March 2016. ^ Wedeman, Ben (20 September 2011). "Government forces enter Libya's Sabha, to cheers". CNN. Archived from the original on 21 September 2011. Retrieved 20 September 2011. ^ "African migrants sold in Libya 'slave markets', IOM says". BBC News. 11 April 2017. Archived from the original on 11 April 2017. Retrieved 11 April 2017. ^ "World Weather Information Service–Sebha". World Meteorological Organization. Archived from the original on 21 March 2016. Retrieved 29 March 2016. ^ "Klimatafel von Sebha / Libyen" (PDF). Baseline climate means (1961–1990) from stations all over the world (in German). Deutscher Wetterdienst. Retrieved 29 March 2016. ^ "Station 62124 Sebha". Global station data 1961–1990—Sunshine Duration. Deutscher Wetterdienst. Archived from the original on 17 October 2017. Retrieved 29 March 2016. ^ "Salvare la Fortezza Margherita" (in Italian). Agcnews.eu. 25 March 2014. Retrieved 26 November 2016. ^ Worsley, D. (19 December 2000). Geological Exploration in Murzuq Basin. Elsevier. p. 112. ISBN 978-0-08-053246-2. ^ Translations on Near East and North Africa. Joint Publications Research Service. 1977. p. 31. ^ Hoad, Phil (19 June 2017). "Sabha in the spotlight: the city where migrants are sold as slaves". The Guardian. Archived from the original on 20 June 2017. Retrieved 21 June 2017. Wikimedia Commons has media related to Sabha.